The National Space Society (“NSS”) congratulates one of its own, Tim Pickens, on the sale of his successful pioneering NewSpace company, Orion Propulsion, Inc. (“OPI”), to another Huntsville, Alabama-based aerospace company, Dynetics. OPI specializes in spacecraft and rocket propulsion design and fabrication, testing services, ground support equipment, and launch operations support. Mr. Pickens, who was chief technology officer for OPI, will serve as chief propulsion engineer for Dynetics. 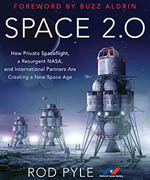 See Dynetics press release on SpaceRef.com. OPI has built and successfully delivered critical hardware for the Ares I Upper Stage Project, and has also successfully completed a qualification test program for the Forward Propulsion System of Bigelow Aerospace’s Sundancer Project, the world’s first commercial space habitat. Prior to starting OPI in 2004, Mr. Pickens worked on Burt Rutan’s team at Scaled Composites, as the Propulsion Lead Engineer for SpaceShipOne. “The taproot of OPI originates in the Huntsville Alabama L-5 Society’s (‘HAL5’) High Altitude Lift-Off (‘HALO’) program”, states Greg Allison, founder of HAL5 and its HALO program, as well as current Executive Vice President of the NSS. “Tim’s lead experience in helping the HAL5 effort to launch a rocket into space, and his hard work and ingenuity, enabled him to apply his enormous talents toward launching an aerospace success story. Tim’s accomplishments set the bar for the rest of us to follow”. “NSS is gratified that its chapter system served as the breeding ground for the genesis of OPI,” added NSS Vice President of Public Affairs, Rick Zucker. 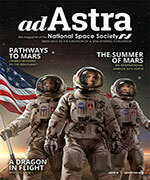 See “In Thrust We Trust” in Smithsonian Air & Space Magazine. “Tim Pickens’ success story is a testament to what can be accomplished by dedicated individuals who support NSS chapters, projects, and initiatives. The sky is no limit for those who choose to champion projects and activities that matter,” says Gary Barnhard, Chairman of the NSS Executive Committee.